The Un-carrier is keepin’ it merry and bright with a free 50” 4K Samsung TV when you buy a new Samsung flagship smartphone. Starting Friday, November 30 get a free 50” Samsung 4K TV when you purchase a qualifying Samsung flagship phone on T-Mobile’s Equipment Installment Plan and add a line (two for new customers) of voice service to T-Mobile ONE or T-Mobile ONE Military plans. T-Mobile is making being home for the holidays better than ever with Netflix On Us and a free Samsung TV so you can binge all your favorite shows. Any TV buff who wants to score a killer deal and avoid the crazy holiday crowds. Bellevue, Washington — November 28, 2018 — Couldn’t bear the crowds on Black Friday? Missed that Cyber Monday steal? T-Mobile (NASDAQ: TMUS) has you covered with a deal sure to make spirits bright. 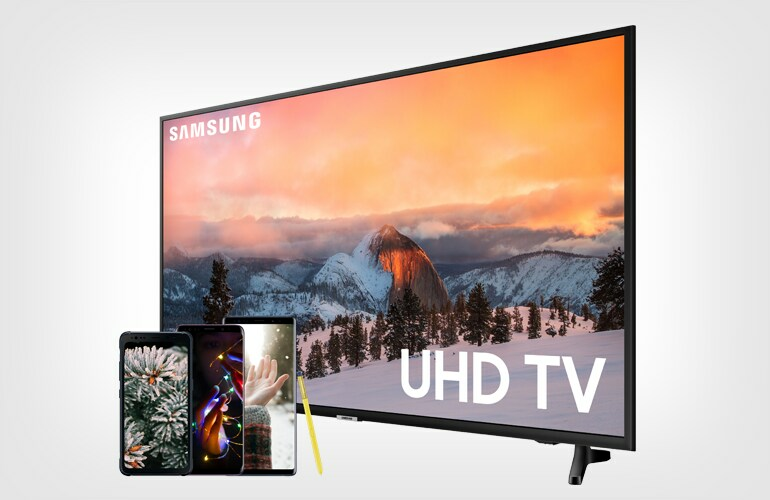 Starting this Friday, November 30, get a Samsung 50” 4K UHD Smart TV for free (that’s right, free) when you pick up a Samsung flagship smartphone on T-Mobile’s interest-free equipment installment plan (EIP) and add a line of service on an eligible T-Mobile ONE Plan with Netflix included. New customers can get in on the deal too by adding two voice lines. But, everybody better hurry ‘cause supplies are limited, and it’s first come first served. This deal includes the sweet Samsung Galaxy Note9, Samsung Galaxy S9, Samsung Galaxy S9+, Samsung Galaxy S8 and Samsung Galaxy S8 Active. T-Mobile ONE is hands down the best value in wireless, with up to $1,550 per line per year in added value according to industry analysts, on top of unlimited talk, text and data on America’s fastest LTE network. You’ll get loads of extras like Netflix on Us on family plans, taxes and fees included, an hour of Gogo inflight wi-fi – plus free gifts and deals every T-Mobile Tuesday and more. Visit a T-Mobile store to take advantage of this deal, and your free TV will be shipped to you after you register online (your T-Mobile mobile expert will help) and follow order instructions delivered via email. When the TVs are gone, they’re really gone – so hurry into your nearest T-Mobile store! During congestion, the small number of customers using >50GB/mo. may notice reduced speeds due to data prioritization. Video typically streams at 480p. Limited time offer; subject to change. Samsung TV: At participating stores. Offer fulfilled with redemption code; limited quantities available on first-to-submit basis Allow 3 days for redemption code and instructions. Qualifying credit required. May not be combinable with some offers or discounts. 1/account. TV fulfilled by Samsung; redeem as instructed before 12/31/18. As America's Un-carrier, T-Mobile US, Inc. (NASDAQ: TMUS) is redefining the way consumers and businesses buy wireless services through leading product and service innovation. Our advanced nationwide 4G LTE network delivers outstanding wireless experiences to 77.2 million customers who are unwilling to compromise on quality and value. Based in Bellevue, Washington, T-Mobile US provides services through its subsidiaries and operates its flagship brands, T-Mobile and Metro by T-Mobile. For more information, please visit https://www.t-mobile.com.